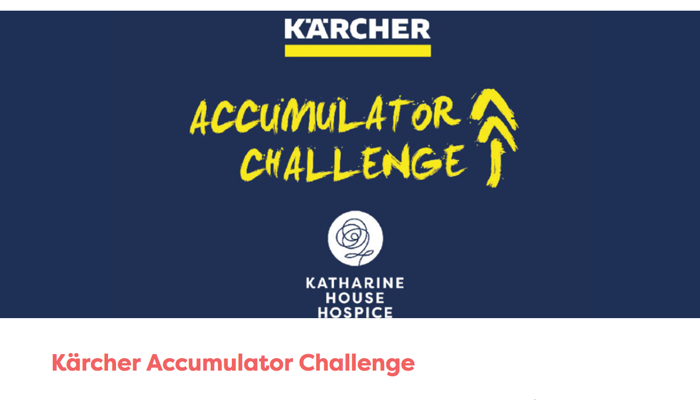 Kärcher and Katharine House Hospice are looking for recruits to the 2017 Accumulator Challenge. Kärcher will give your business £50 and 3 months – then it’s over to you to see what you can turn it into! The more out of the box and creative your ideas, the more money you’ll raise to support the work of Katharine House Hospice. Compete against other teams for a chance to win an award at a special ceremony hosted by Kärcher in February 2018. As well as knowing that all the money you make will make a real and lasting difference to the local community, taking part is also a great way to encourage team building within your organisation, inspire staff to think creatively and create healthy competition between offices. To sign up visit www.karcher.co.uk/khh or for more information email Jessica.hill@khh.org.uk .